Pinterest is a photo-sharing social media site that utilizes a pin board style website to create and manage theme-based image collections such as events, interests, and hobbies and much more. Users can browse other pin boards for images and “Repin” things they want others to see or want to save. But how is this social media platform relevant to real estate? 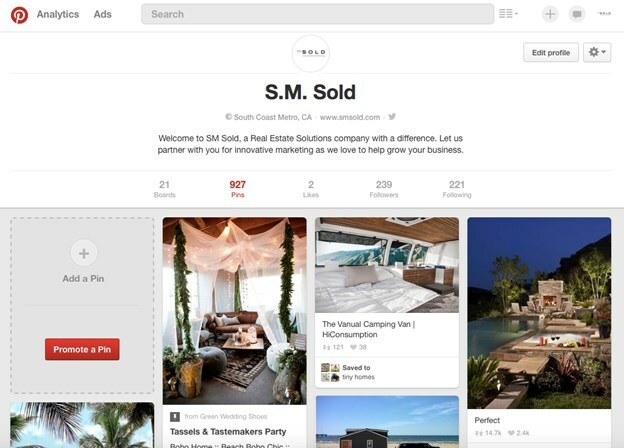 Utilizing Pinterest has become the best and most modern ways to market real estate websites and listings. As Pinterest is a visual social media platform reliant on photos, people can browse photos of interest and share them by “repining” them to their account. Realtor’s suggest that they are starting to get more traffic coming from Pinterest than other social media and online platforms as Pinterest showcases high quality photos of their homes. That’s not all, Pinterest is a great technique for search engine optimization (SEO). As users re-pin photos it increases links to your website. The key to increasing your SEO is linking your photos to your website so when some one clicks on the pin it takes you to the webpage to view the entire listing. This will not only improve SEO but it will increase the amount of traffic to the site. Pinterest is organized by “boards” or categories created by the user. To increase followers and SEO it is wise to label your boards by areas your real estate firm represents like Irvine Real Estate, Orange County Luxury Homes etc. Not only will this help users search for you easily on Pinterest but your boards can pop up in search engines as well. Social Media integration is also a fantastic functionality on Pinterest. As you are creating a pin, you of course pin it to your pinboard, but can also share a link that connects to your Twitter! The option to also tweet out your pins and other Pinterest activity, makes Pinterest extremely friendly for savvy social media users. Utilize those hashtags on Twitter and provide the link to your newly created pin and you’ve got yourself a great deal. It’s important to not only have boards of your listings, but other boards of different listings from other agents. Through this you will become linked throughout Pinterest and have a greater chance of users finding your page. Go through your MLS listings and find interesting or really nice houses, starting with the most expensive ones first. The more unique or interesting the picture the more likely it will be repinned and shared amongst other Pinterest users. In the description add keywords you’re targeting and make sure to check the link is correct going back to your website. It’s important to have search friendly and generalized descriptions, not long paragraphs making. Keeping photo descriptions short and to the point are key! The longer the descriptions, more difficult it will be for Pinterest to pick up on your boards in a search. Incorporate key words users might search and match it to your descriptions. Like most social media sites, the more effort you put into the site, the better your outcome will be. It might take some time to set it up and get used to, but the rewards are undeniable. Pictures on Pinterest can go viral at any second and you never know if that will be your photo until you try. Don’t want to take the time to figure everything out or the time to keep up with your Pinterest account? Let SM Sold manage your social media accounts! We will partner with you to make sure you have the best social media presence out there! Contact us today for more information about how we can do more than just social media for you! Don’t forget to stay connected with all of SM Sold’s social media platforms!